PIV software Koncerto Overview | SEIKA Digital Image Corporation. 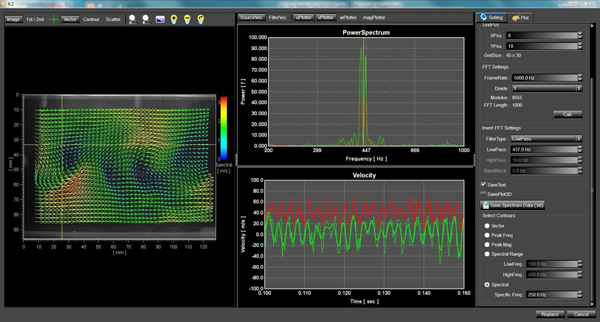 Koncerto Ⅱ is an integrated PIV software combining high level system control performance and advanced analysis capability. It support a wide range of measuring cameras, lasers and peripheral equipment. It is designed as a platform for laser measurement and imaging measurement such as PIV and PLIF. Algorithms developed at the German Aeronautics and Space Administration (DLR) include time-series PIV algorithms that can analyze accurate periodicity with time series PIV and also have temporal interpolation function, as well as state-of-the-art deformation correlation, We also line up SAT-PTV etc. which eliminates the influence of Brownian motion without time averaging with micro PIV and enables time series analysis. Koncerto supports various PIV algorithms.Koncerto is designed for easy adding support for new algorithms. Koncerto supports several types of stereo calibration target such as a single height double side with traverse type, a double height double side with common lower plane no traverse type, etc. Koncerto supports distributed processing and script programming. These are especially useful for handling large amount of data such as Time Resolved PIV. With the sophisticated high speed PIV processing algorithms, Koncerto processes a large amount of data in a short time automatically. Captured images and analyzed data can be saved and output in various formats. For example, output PIV data to a data visualization software such as Tecplot, and sliced images on micro imaging are transferred seamlessly to a volume rendering software..
Online multi view window enables you to monitor both A and B images at the same time. Online Scatter View is useful for checking several PIV parameters such as the image quality, delta T, the intensity of validation filters, etc. Online PDF View is useful for evaluating the intensity of peak locking, etc. It is one of the criteria for choosing the PIV analysis algorithms. Timing View is used for setting the hardware timing such as delta T and various delays.